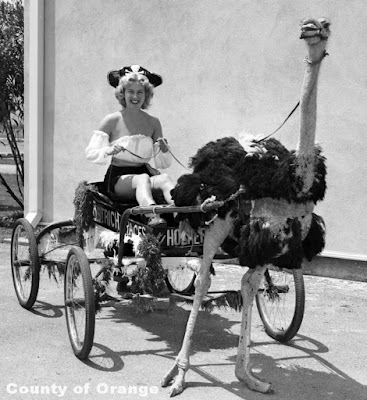 Ostrich racing (in pirate garb) at the Orange County Fair, 1951. 1) The Crystal Cathedral/Christ Cathedral campus in Garden Grove: It’s not just a religious site, but also a “historical petting zoo” of modern architecture, with buildings designed by Philip Johnson, Richard Neutra, Dion Neutra and Richard Meier. Richard Neutra’s drive-in church (now called the Arboretum) is a particularly wonderful landmark of the mid-century California car culture. And don’t miss the beautiful little chapel in Dion Neutra’s Tower of Hope. 2) Little Saigon in Westminster and Garden Grove (centered on Bolsa Ave between Magnolia Ave. and Bushard St.): Make a day of it and explore. Along the way, be sure to visit the Asian Garden Mall, a couple of Buddhist temples, the Hoa Binh Garden Grove Supermarket (with huge fish swimming around in tanks next to the fish counter), and the large bas relief mural and statues in the parking lot of the 99 Ranch Market. Moran Street, north of Bolsa Ave is also worth a detour – while visually unexciting, it’s the international hub for free Vietnamese media. 3) A drive through Live Oak Canyon offers a glimpse of the beauty of the Santa Ana Mountains without having to off-road or hike. 4) The Lovell Beach House, in Newport Beach: Although this is a private residence (please don’t disturb the owners), it’s an important stop for anyone who cares about architecture or history. This 1926 masterpiece by Rudolph Schindler is the spot where European modernism came to the United States. Its impact on our current built environment is tremendous. 5) A drive through Laguna Canyon, from Irvine down to the beach, is another place where one can still glimpse the beauty that brought so many people to California in the first place. Be sure to stop and see the sea lions and other critters at the Pacific Marine Mammal Center. 6) Heisler Park in Laguna Beach, offers one of the most beautiful views of the Orange County coast. 7) El Farolito Restaurant, Placentia. Yes, there are some satellite locations, but go to the original in Placentia. This family owned and operated Mexican restaurant – in a repurposed old house – is probably the best in Orange County. 8) Indoor Swapmeets – Enter a world you may have been unaware of at the Brookhurst Indoor Swap Meet or the Stanton Indoor Swap Meet. 10) For lovers of all things botanical, there are two great locations in Corona del Mar: Roger’s Gardens and the Sherman Gardens & Library. Very different places, but both pretty amazing. Roger’s displays for Halloween and Christmas are particularly wonderful. 11) Disneyland: I’m sure this is already on your list, but I’m looking at this from another angle. This was the only Disney park Walt had a direct hand in. It was the first Disney park and it changed theme parks utterly and forever. The Pirates of the Carribean, if you’ve never seen it, is worth the price of admission alone. Even outside the park, there’s some wonderful things to see, including the beautiful lobby of Disney’s Grand Californian Hotel and the Disney-fied Tiki bar known as Trader Sam’s at the Disneyland Hotel. 12) Anaheim Halloween Parade: A tradition since the 1920s. Always held on the evening of the Saturday before Halloween. Earlier in the day there’s a Fall Festival held downtown. 14) The Crab Cooker restaurant – Locations in Tustin and Newport. (Newport location temporarily closed for reconstruction after idiot developers destroyed the old historic bank building they’d been in since the 1950s.) The Crab Cooker is an institution. Simply but perfectly cooked fresh fish with cheese potatoes and coleslaw – all served on paper plates. Oh, and then there’s their wonderful red clam chowder – served in paper bowls. 15) Mission San Juan Capistrano is obvious, yes. 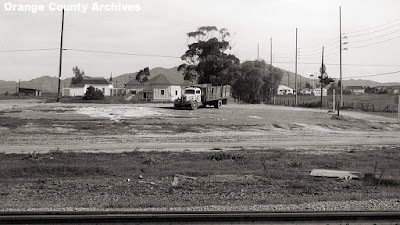 But less obvious is the Los Rios District, across the railroad tracks from the Mission. It’s the oldest continually occupied neighborhood in California and his home to some great historic homes and the San Juan Capistrano Historical Society. 16) A day antiquing and dining in Old Towne Orange. 17) Visit the inside of one of the Lighter-Than-Air (blimp) hangars at what used to be the Tustin Naval Air Station (later MCAS Tustin). They are the largest free-standing buildings in the world and to walk inside one is to have your mind and sense of scale blown all to hell. Your brain simply refuses to believe what it’s seeing. Getting in will require finding one of the rare public events, meetings or tours held there. 18) The Nixon Library in Yorba Linda. No matter your politics, this place is fascinating. 19) I agree with Phil Brigandi that getting to the top of Old Saddleback is a perfect “Orange County bucket list” objective. But I’ll point out that if you’ve got a good off-roading vehicle, and if the roads are open, you can DRIVE to the top. I certainly don’t recommend driving to the top in a Lexus, but I’ve proven that it CAN be done. 20) Visit the Blas-Aguilar Adobe museum in San Juan Capistrano for a tour and a bit of perspective on the Acjachemen people who already lived here when the Franciscan missionaries arrived. Check for open hours. 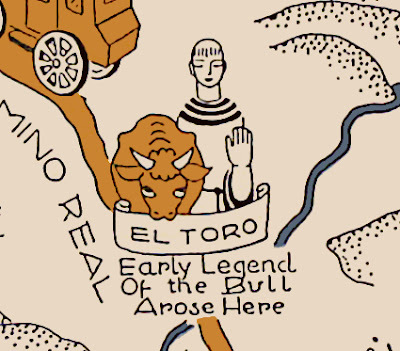 How El Toro got its name (which means “the bull” in Spanish,) has been the subject of many conflicting explanations. An attempt to find the truth is in order. El Toro is on part of the old Rancho Cañada de Los Alisos, granted to Jose Serrano in 1842 with additional acreage added in 1846. 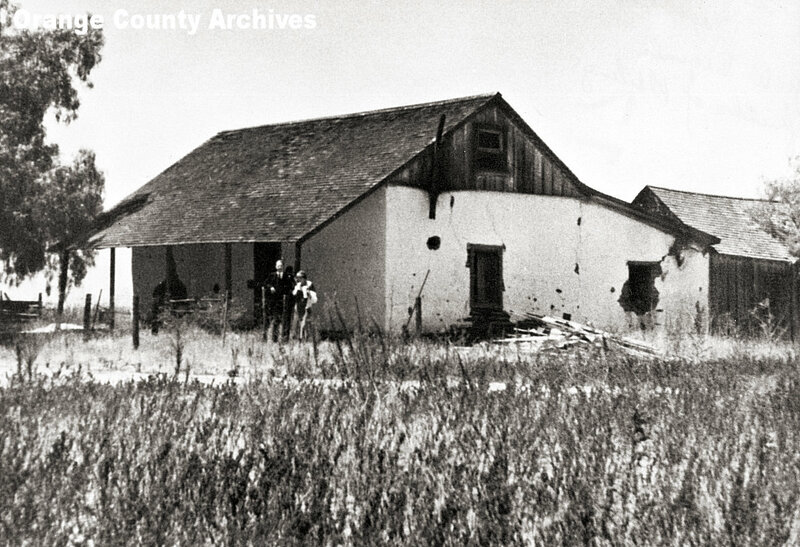 Dwight Whiting acquired most of this property for his Whiting Ranch in the late 1880s. Judge Richard Egan of San Juan Capistrano applied the already longstanding “El Toro” name to the Santa Fe station here in 1887. 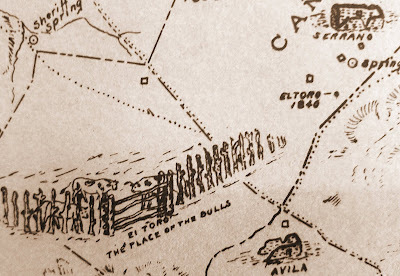 Although the town itself was initially called Aliso City, the El Toro name was already ingrained in the hearts of locals. The town would be known as El Toro, and soon there was also an El Toro Post Office (1888), followed by an El Toro School District. El Toro kept its name for over a century and developed from a small rural crossroads into a sprawling suburban landscape. In the mid-to-late 20th century, it grew so fast that newcomers (with no sense of place or local history) greatly outnumbered established local families. So when the community incorporated as a city in 1991 the residents voted to change the town’s name to Lake Forest, which was lifted from a 1960s housing tract. The Serrano-Whiting adobe. Now part of Heritage Hill Historical Park. So what are the competing origin stories for the name El Toro? A California vaquero roping cattle. 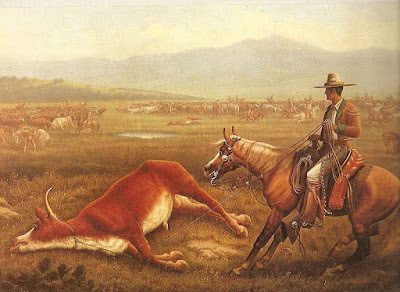 Later generations of Serranos identified the unfortunate animal as a white-faced prized bull owned by Jose’s son, Francisco. As in the old game of “telephone,” it seems this story has changed over time. One local recounted a happier mutation of the tale in which the rancho’s vaqueros (cowboys) couldn’t free a bull stuck in a waterhole during heavy rains. But somehow, after several days, the bull was able to struggle free all by himself. 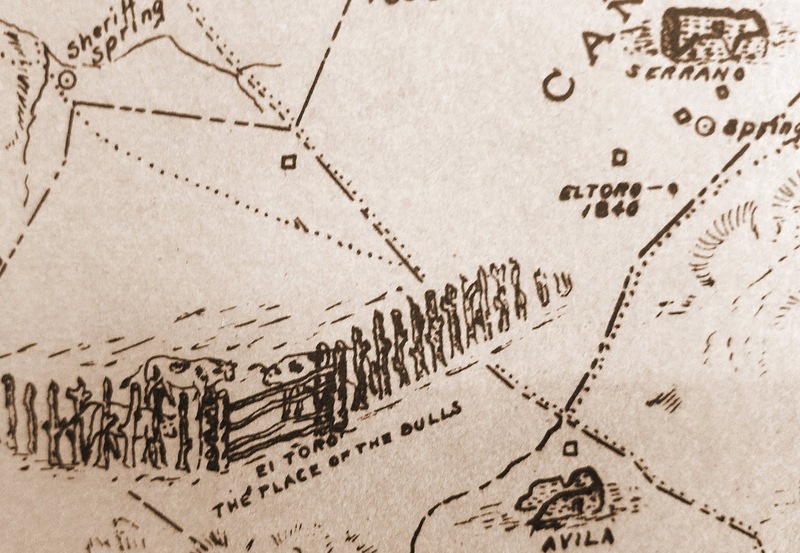 The “Place of the Bulls” appears on a 1936 map of local historical sites, created by the WPA. 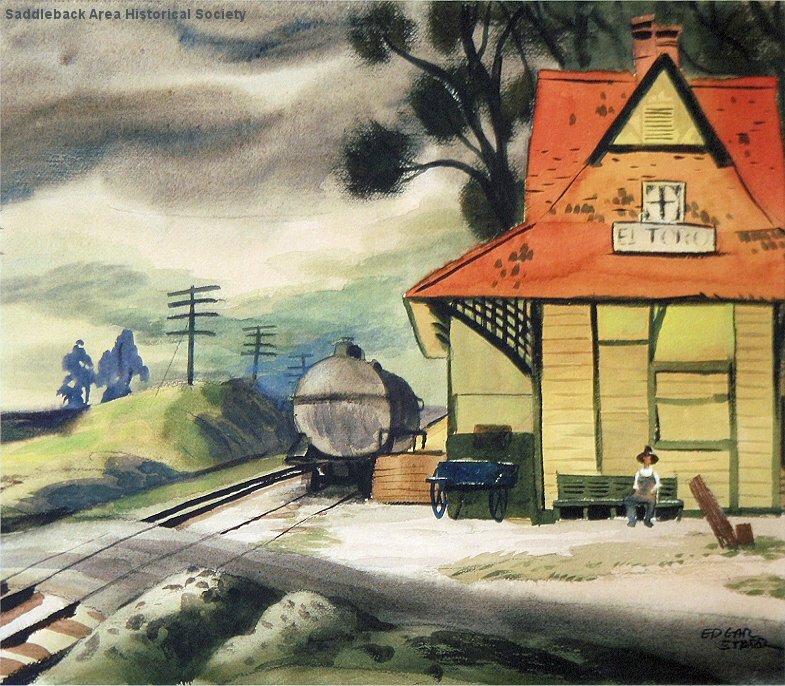 This tale is also referenced by Osterman and in a 1929 pictorial historical map of Orange County created by artist Jean Goodwin. Detail of map by Jean Goodwin (later Jean Goodwin Ames), published by Fine Arts Press for the local AAUW chapter. All five of these stories have staying power, but are any of them true? The 1837 date pushes the name back into the mission era and debunks all the stories involving the rancho (granted in 1842), the Serrano Adobe (built in 1863), farmers (who wouldn’t have been on the scene until the late 1880s at the earliest), or the seeking of aid in Santa Ana (founded in 1869). In fact, the only one of these stories that isn’t shot down by known historical facts is the one about the padre stopping a charging bull with prayer. But we have no solid source for the story and it does have the ring of a parable fabricated to make a point about the power of prayer. In short, we may never know exactly how El Toro became El Toro, but we know that it stayed that way for at least 154 years. The village of El Toro, 1970. Railroad tracks in foreground. And why did people vote to change El Toro to Lake Forest in 1991? Residents of the Lake Forest planned communities thought their name sounded more chic. Some also did not want to be associated with the Marine Corps Air Station El Toro – what with all its unfortunate connotations of defending our country and our freedom. 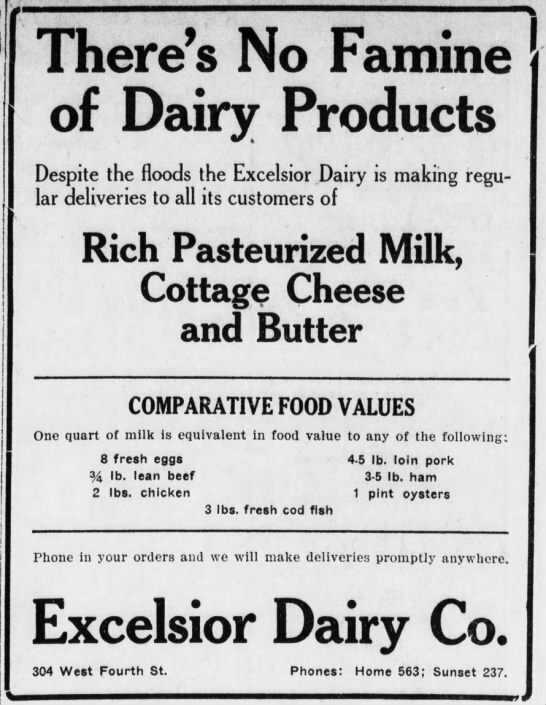 Others felt, in the words of one resident, that the name El Toro sounded “less than up and coming." To be fair, the name of the Lake Forest housing tract had a story behind it as well: It was named for a manmade forest and some manmade lakes. In the late 1800s and early 1900s, "experts" touted the quick-growing eucalyptus tree as a solution to California's need for lumber and a source for medicinal oils. Dwight Whiting took the bait and planted over 90 varieties of eucalyptus on 400 acres. But the wood warped, split when you put nails in it, and stank when you burned it. The "medicinal" oils were also disappointing. Whiting tore out some of the trees to plant other crops, but many still stand today. The lake in Lake Forest refers to the man-made lakes built by developer Occidental Petroleum in the late 1960s. The first was originally called Lake I, and is actually two lakes, now sometimes called Hidden Lakes. The other has the romantic and inspiring name of Lake II. The closest thing to a natural lake in the area—a glorified mud puddle near El Toro Road at Muirlands—was turned into a grocery store parking lot long ago. 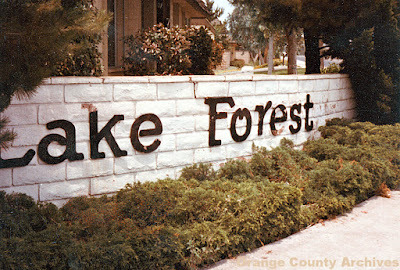 Sign at the entrance to the Lake Forest housing tract. The name change to Lake Forest was both sad and infuriating to those who had lived in the area for many years, or generations. "It's like losing a right arm … It's either you take it like a man or cry like a baby " said Ray Prothero a member of a local pioneer family during an interview with Los Angeles Times reporter Davan Maharaj. His voice breaking Prothero said, "They shouldn't change the name of the library and the other institutions. It will be like erasing history." When informed of the name change by Maharaj, then-90-year-old Reyes Serrano – a retired cowboy and the great grandson of Don Jose -- said, "It makes me want to take my gun and go up there and make them change it right back to El Toro." His wife, Dona, had a similar reaction: "You mean they actually did that?" she asked with a pained expression. "It's these damn city people that come to our country and make a city and change the name. Dammit!" On the list of strange Orange County street names, Trask Avenue ranks right up there with Heil Avenue, Meats Avenue, and Weakfish Lane. Trask runs about eight miles through Westminster and Garden Grove, passing such landmarks as the Brodard Chateau restaurant, the Garden Grove Elk’s Lodge, car dealerships, Leroy L. Doig Intermediate School, and the headquarters of the Orange County Motorcycle Club. But where did Trask Avenue get its odd moniker? The surname Trask refers to those from the North Yorkshire town of Thirsk, which Norse invaders originally named Tresc or Trask – meaning marsh. Although Westminster was pretty marshy in its day, the street’s name is actually a reference to the unfortunately named Dummer Kiah Trask (1860-1914). Trask was an Ohio native who spent his formative years in Maine. He came to California in 1882, initially living in Stockton where he taught school, studied law, sat on the board of education, and served as principal of a business college and normal school. In 1887 he married Ida C. Folsom (1860-1922). 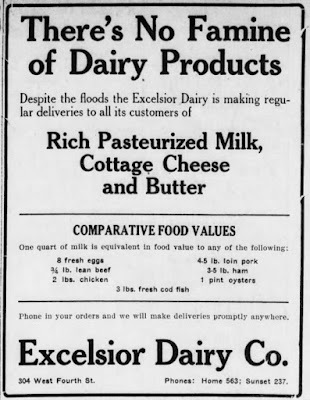 Together they would have four children: Ida Mary Trask (1889-1975), Dummer F. Trask (died in infancy in 1891), Dorothy Kate Trask Goodrich (born 1897) and Walter Folsom Trask (1896-1919). In 1890 the family moved to Los Angeles, where “D. K.” set up a law practice and served briefly on the L.A. Board of Education. 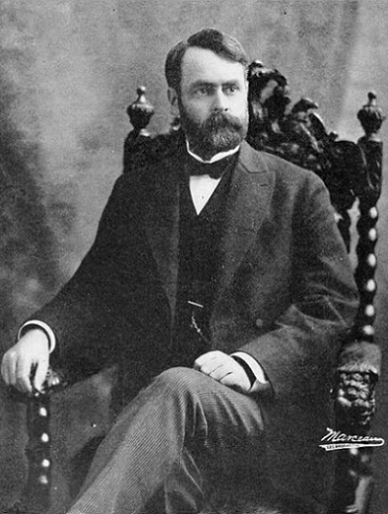 In 1898, Governor James Herbert Budd appointed him to a vacancy on the Superior Court of Los Angeles. Trask was reelected to a full six year term as judge in 1900, and for a few months in 1905 he was even discussed seriously as a candidate for governor. In 1910, Trask purchased seventy acres in Westminster, bordered by today’s Trask Ave. on the north, Westminster Ave. on the south, Richardson Way on the west, and Beach Blvd. on the east. D. K. Trask died of a stroke on March 12, 1914 while in the middle of ‘trying a lawsuit’ in probate court. Ironically, he died without a will. Ownership of the Westminster property ultimately became half owned by his widow, Ida, with the rest split evenly between his three living children. So far, no evidence has been found that the Trasks ever actually lived on this property. When Trask Avenue received its current name is unknown, but references to it can be found as early as May 1926 when the road was significantly widened and improved.